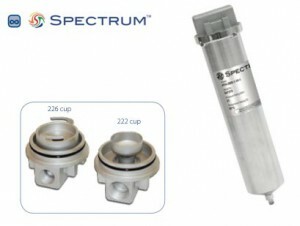 The SPECTRUM Inox stainless steel filter housings, from 1 round 10″ up to a multi 52 round 40″ housing, all represent a tried and tested system that is easy to install, operate and maintain. Constructed from 316L stainless steel across the range, the Inox housings are supplied with a universal cartridge adaptor as standard in all multi-round housings. All vessels in the range will accept DOE cartridges with adjustable cartridge sealing, meaning variable length cartridges can be installed into the housings easily and securely. 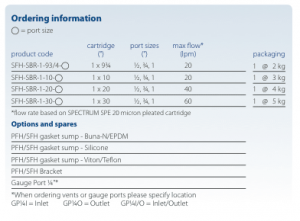 Whilst all Inox stainless steel housings come with Buna-N FDA grade gaskets as standard, material upgrades are available where compatibility is required (see ‘Customisation’ section below). All Inox housings have a standard finish of polycoat over stainless steel to give a smooth, clean look to your housing. If the standard configuration does not suit the application a total customisation is available on short lead times. Upgrade to a Premier multi-round vessel by adding fast action swing-bolt closures for additional security. 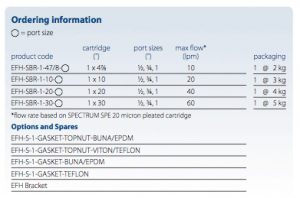 Flow data is based on 15 lpm per 10″ length with a 20 micron SPECTRUM SPE pleated cartridge at 0.14 bar (2 psid) clean and a viscosity of 1 cps. 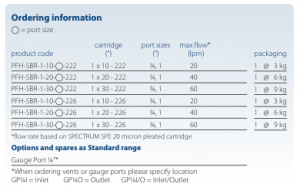 Flow rates are for guidelines only. 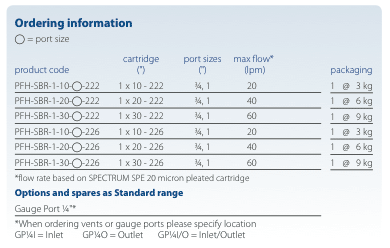 Actual flow rates are based on fluid, viscosity, cartridge type, micron ratings and other factors. The Inox Economy Filter Housing (EFH) is an entry level housing into the heavy-duty industrial and commercial stainless steel housings range, equipped with 1⁄2″, 3⁄4″ and 1″ BSP ports in all 316L stainless steel construction with a polycoat finish. 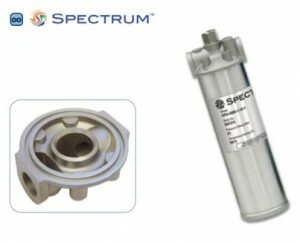 For lower flow applications where space is an issue a 47/8″ is available. Housings accept DOE cartridges with radial flow and secure with a tie rod through the centre of the head, tightening by head nut. 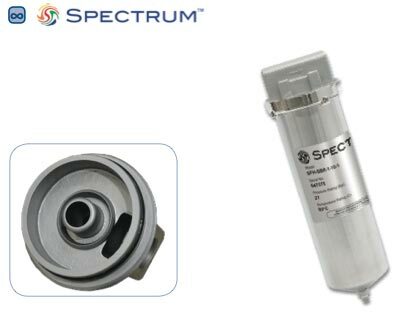 Cartridge change- out is made easy with a base drain to reduce spillage and the housing requiring just 60mm ground clearance. 1) 10″ housing accepts 93/4″ and 10″ cartridge. 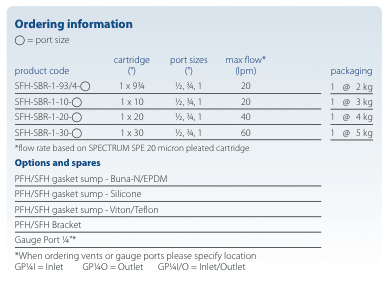 2) Standard gasket is Buna-N. Available in all 316 stainless steel, the Standard range of Inox vessels (SFH) have a simple ring closure threading from the sump to the head for quick filter change-outs. This also eliminates the need for a tie rod, enabling the use of both radial and longitudinal flow cartridges. The 1/8″ drain at the base of the sump allows for all liquids to be easily drained, with minimal ground clearance required for cartridge change outs. Vessels are supplied as standard with Buna-N O-ring, mounting bracket kit and ring closure tool to assist with tightening the sump and head closure. The SPECTRUM Inox Premier filtration series of single cartridge housings is an all 316 stainless steel construction available in 10″, 20″ and 30″ lengths with 3/4″ or 1″ BSP ports. 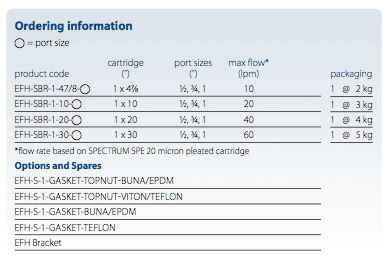 These housings accept cartridges with a 222 or 226 SOE cartridge configuration where added seal security is required, generally sub-micron applications. configuration Options include:- sanitary fittings, high-polish finish for high-purity applications, vent and gauge ports. Comes as standard with mounting bracket kit, ring closure tool, Buna-N O-ring and 1/4″ drain.